Most local governments in Wisconsin have certainly given their employee compensation packages a closer look over the last few weeks as the budget repair bill receives judicial consideration in Madison. The eventual implementation of what now has passed as Wisconsin Act 10 may soon be approaching, and elements within it are certain to help governments in some respects, but may tie their hands in others. One knot that has yet to be fully assessed is the effective decline in salary growth for public sector employees resulting from new compensation guidelines. Limited salary growth paired with elevating fringe benefit costs will eat into take home pay. Though this diminished growth may be a fiscal necessity, locking it into perpetuity raises some difficult questions. Under the budget repair bill, total base wages for all public employees would be prohibited from growing annually beyond the increase of inflation (measured by the national average CPI-U), unless approved by referendum. This measure of inflation has averaged a rate of 2.5% over the last 10 years. While an annual salary increase of 2.5% does not appear unreasonable, it is important to recognize that most public sector workers also will be asked to pay more for their pension and health care costs year after year. Those costs, incidentally, have grown far faster than the CPI-U. The inability of salary growth to keep pace with the rise of fringe benefit costs may cause public employees to experience successive years of increasingly stagnant compensation. A quick look at fringe benefit growth historically reveals the potential for diminishing growth in public sector pay. The table below shows five years of pension contributions and health care premiums for general employees working for the State of Wisconsin. This information shows that the growth in annual pension contributions has been relatively flat, as the contribution to the Wisconsin Retirement System (WRS) has averaged a 1.9% increase annually from 2007 to 2011. This would signify that annual salary increases allowed under the new law could be sufficient to offset the growth in the employee share of pension costs. However, it has been suggested that pension contributions to WRS may need to increase significantly in the future to reflect more realistic interest rate assumptions and other factors. If that development does occur, employees could see pension costs grow more rapidly than inflation, resulting in take-home salary growth that does not keep pace with inflation. Health care costs pose an even bigger problem for public sector employees, as premiums have steadily climbed far faster than inflation. 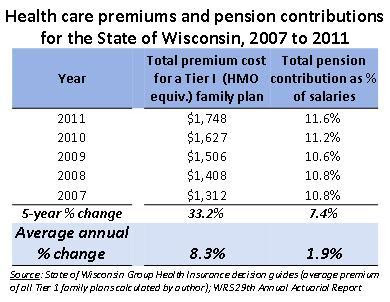 Premiums for the state’s Tier I family plans, for example, have grown at an average of 8.3% from 2007 to 2011. Because it appears unlikely that health care inflation will be reduced to a level equivalent to general inflation, public employee salary increases are unlikely to keep pace with growing health care contributions. While a compelling case can be made for the need to require public sector employees to contribute significantly more to their health care and pensions costs, and while many private sector workers face similar salary and benefit pressures, public sector administrators face several important long-term questions. For example, what tools will administrators have at their disposal to attract and retain valued employees if pension and health care cost increases negatively impact earnings potential? Will the repeal of most collective bargaining rights allow administrators new liberties in shifting salary dollars to ensure they can recruit for priority positions, whether it be through altering salary schedules, adjusting position classifications, or offering bonuses? And if so, what would such a shift mean for the rest of the employees, given that total salary expenditure increases are restricted? In light of the many retirements projected in response to Wisconsin Act 10, state and local government administrators may be seeking answers in the very near future. UPDATE: It has been correctly pointed out that the inflationary limit on public sector pay increases applies to public sector workers who are subject to collective bargaining agreements only. However, the compensation changes of non-represented employees often mirror those granted to represented employees.